As a result of heavy rainfall puddles formed around the sandpits. The children love playing in the puddles as water play is a shared interest of theirs. 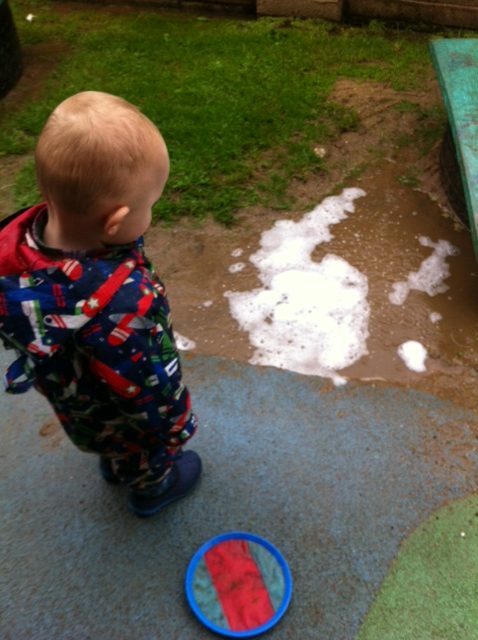 In order to expand this interest we added washing up liquid to the puddles which created large quantities of bubbles. This really appealed to the children with two of them jumping right in! Once the bubble puddles were created the children began to walk through it. Having shown interest other materials were introduced including footballs, rubber ducks and bowling skittles. The children loved splashing through the bubbles. Earlier in the week the children made a house using pallets, reels and tyres. Tiaran and Rosin decided it would be a good idea to make a sign and paint their house or rather their large tree house should I say! So we brought out some paint, brushes, trays, sponges and containers for the children to explore and experiment with. The children loved all the different colours especially the metallic ones! Conor decided to paint the top of the reel in loads of different colours while Tomas and Tiarnan thought it looked better to use their hands. Peter really liked to ix the colours together with a sponge while Peig was very careful with the paint brush. Her Mum said she loves to be in the middle of all the jobs! As it was a rainy week we had so many muddy puddles to play and jump in we had to put on our wetsuits. We decided to make some paper boats to float in the puddles. We made the boats and coloured them inside but when we went out we quickly realised that the paper boats didn’t last very long so we tried other materials but the children preferred the paper ones! Cian’s Mum loved the boats and he decided to take one home.